This image was captured in December, 2005 showcasing the impressive blooms of Guzmania lingulata var. minor, grown in our garden border. I just love seeing their strikingly beautiful orange-scarlet bracts sitting atop their rosette of fresh-green leaves. We started with a pot of three young plants, presented to us by John’s god-daughter in February 2005. Plant type: An ornamental perennial plant, native to tropical Central and South America. Light: Low to moderate light or filtered sun. Advisable to shade from direct sunshine that can burn their foliage. Moisture: Regular watering (preferably with rain water) into the central vase-like part of the leaf rosette called ‘tank’. The tank should be kept filled with water at all times, being careful not to let water soak the soil as overly wet soil can cause root rot. Flush the tank periodically by pouring fresh water into it to prevent stagnation and buildup of mineral salts. Soil: Well-drained loam-based medium, preferably an equal mix of garden soil, peat and sand. Propagation: From offsets (pups) produced at the base of plants. The pups can be snipped from the mother plant with a sharp knife when they’re about a third or half the size of the parent plant. They can even be separated easily with our fingers, after removing the mother plant’s lower leaves protecting them. It doesn’t matter whether the pups have started to form roots or not, just pot or ground them in suitable growing medium as they root easily. Nonetheless, the longer the pups are left on the mother plant, the quicker they’ll reach maturity. 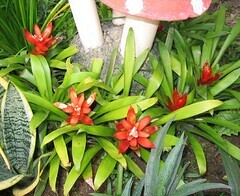 Features: Guzmania lingulata var. minor, an epiphyte is another ‘tank’ bromeliad that is characterised by its distinct arrangement of overlapping leaves that form a natural watertight urn to retain water. Plant is often terrestrial and low-growing, about 8-12″ in height and as wide or more, with clump-forming habit. Apple-green leathery leaves are lanceolate, spineless, smooth-edged and glossy, closely overlapping around a short and stout central trunk in a rosette-like form, and adding new leaves from the center. And, from this center will sprout a stout tube of showy and impressive orange-scarlet bracts (modified leaves) with a cluster of small white flowers. Each plant will only bloom once though the inflorescence can last for 2-3 months, but will then produce offsets or pups at basal leaves, that can grow and bloom themselves, either nourished by the mother plant or grown separately as new plants. The mother plant will gradually die when it runs out of energy after producing many pups or grand-pups. Usage: Guzmania lingulata is popularly grown indoors as a potted houseplant or in green houses because they can thrive in low to medium light and have colorful blooms that are long lasting. Great specimen for interior decoration too with its attractive flower spikes of gorgeous bracts, ranging in colors from yellow to orange to scarlet, and to red and deep purple. Grown outdoors, it will be most ideal in front-of-the-border grouping in garden beds or borders, as well as a landscaping plant for rock gardens. 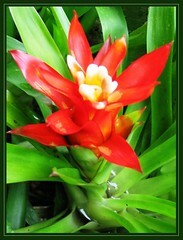 Care: This Guzmania plant is relatively carefree. To ensure success, see that it is properly watered, receiving enough light and warmth, maintain high humidity and good air movement, plus monthly light-fertilizing with a balanced fertilizer. Cut away spent inflorescence to look tidy and divert the plant’s energy to producing more plantlets. If necessary, trim back the leaves of the parent plant to allow freer growth of their pups. Look out for slugs, otherwise insect pests and plant diseases are hardly a problem with Guzmanias. To know much more on care and culture of Bromeliad which includes Guzmanias, follow this very informative link of Bromeliad Society International, and the not-to-be missed ‘Frequently Asked Questions’. 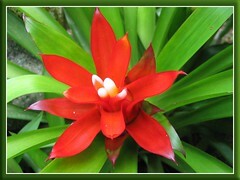 Ahah, just read that you can force bromeliads to flower by exposing it to ethylene gas that can be emitted from a ripen apple – place the plant inside a clear, airtight plastic bag with a ripe apple for two to three days and depending on the type of plant you have, flowering will begin in six to fourteen weeks. How interesting! :) Wonder whether this is applicable to our Zygocactus which has not flowered for more than 3 years?